Reports last week showed sea ice around the South Pole covered more than 20 million square kilometres for the first time in recorded history. Now, Dr Jan Lieser from Hobart’s Antarctic Climate and Ecosystems Cooperative Research Centre (ACE CRC) says sea ice will reach its peak extent in the Southern Ocean within the next fortnight. The figures have been pounced upon by climate change sceptics such as Australian commentator Andrew Bolt and US radio talk show host Rush Limbaugh. Clearly, it is easy to assume that a record amount of ice would suggest lower temperatures allowed it to form, but Dr Lieser says the growth is actually a sign that things are warming. “The increase in Antarctic sea ice extent might seem paradoxical given changes in the global climate, but it's not when we consider some of the other factors at play,” he told the ABC. “Fresher water freezes at a higher temperature, and we know that the sea water around Antarctica is becoming less salty partly due to the rapid shrinking of the thick Antarctic ice sheet over land,” Dr Lieser said. It is important to make a distinction between the ice shelf and sea ice. 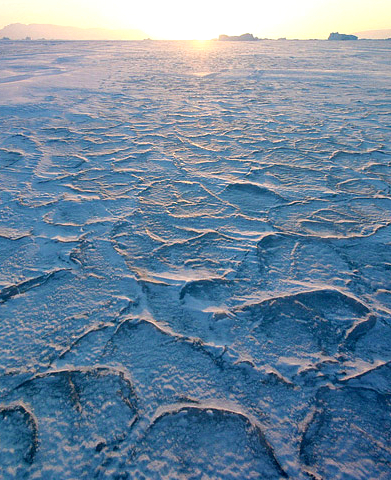 Studies have shown that a changing climate has seen the Antarctic ice shelf shrink by about 100 gigatonnes per year.